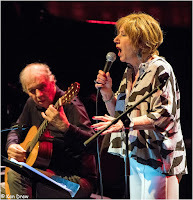 Norma Winstone and Ralph Towner go way back. 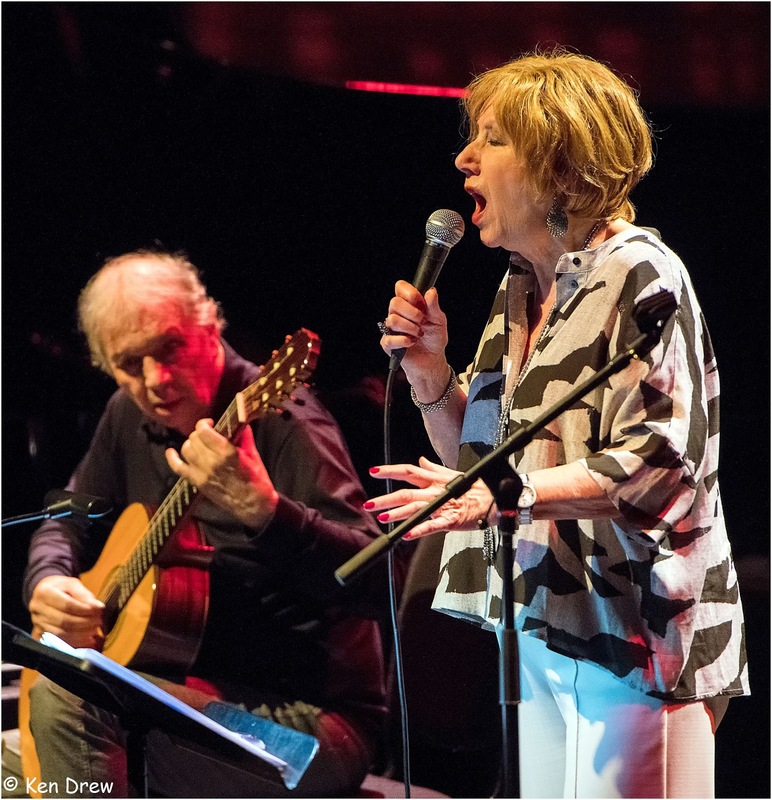 This rare duo performance at Sage Gateshead attracted a discerning audience in Sage Two on the middle evening of three during the fourteenth Gateshead International Jazz Festival. 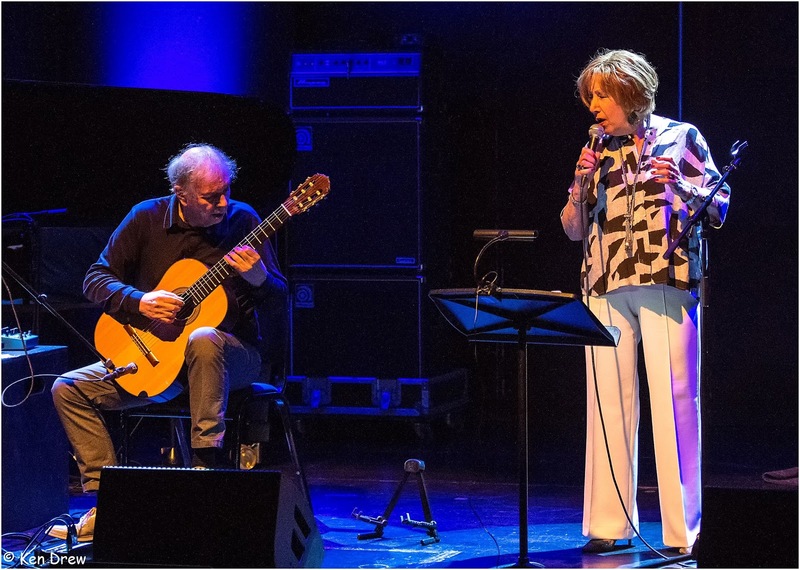 The voice-guitar (and occasional piano) duo played songs from the best part of forty years ago through to as recently as last week when Winstone wrote the lyrics to the eponymous track of one of Towner’s earlier signature ECM albums. The evening began with several notable musicians – one of them a supremely gifted vocalist – in the front row within touching distance of Winstone and Towner. A Breath Away – yes, that’s it, the front row was but a breath away – opened the concert, and it is likely those sitting up close would be able to hear every nuanced whispered breath. Towner’s Always by Your Side followed and the penny dropped…this was a masterclass in the making. Towner’s immaculate acoustic (classical) guitar playing would either inspire or dispirit the guitar student in the house, such was his mastery of his chosen instrument. The classy duo introduced Jule Styne’s Make Someone Happy giving it an impeccable reading. It was as if we were part of an intimate gathering, and, of course, we were. At this point in the proceedings, the seated Towner declared he was feeling the cold and promptly stood up, momentarily leaving the stage to put on his jacket! And why not?! Their set continued with Winstone’s newly written words to Anthem, Towner’s millennial album on Manfred Eicher’s esteemed record label. For the most part, the concert took the form of Winstone the lyricist penning words to Towner’s compositions with the occasional departure to introduce an enduring GASbook tune to the set list. One such classic departure, Rodgers and Hart’s Nobody’s Heart Belongs to Me, projected to all parts of Sage Two housed within Norman Foster’s landmark building on the banks of the Tyne. The Glide from Towner’s days with Oregon followed by another ‘old one’ as Winstone called it, Beneath An Evening Sky, again from the ECM catalogue, made it an evening to remember. The duo concluded their masterclass with a further selection from 2000, or thereabouts – The Prowler – from the aforementioned ECM album Anthem. A most memorable evening.